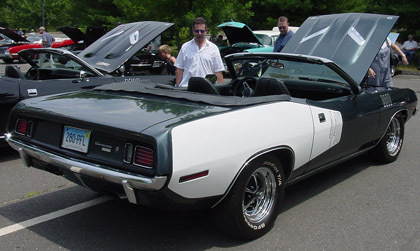 Very nice Plymouth 'Cuda convertible, with a 440. #4, Yeah, he had to weigh acceleration versus chick magnetism I guess. #5, Bet that Impala is quite the chick magnet eh? I love these things so much. The Challenger/Cuda have to be the coolest cars of all time. I always did like the huge badge on the side that said what was under the hood. Assuming this is legit, then it's one of 17 440+6 convertibles built in 1971. They're nearly as rare as the Hemis.